Almonds and poppy seeds are the perfect pair. In a large bowl, whisk together the flour, 1 cup sugar (reserve the remaining 2 Tbs sugar), baking powder, and salt until combined. Stir in the sliced almonds (reserve 2 Tbs for topping) and the poppy seeds. In a second bowl, combine the remaining ingredients and whisk until fully combined. Pour the wet ingredients into the dry ingredients and stir just until everything is moistened and combined. Be careful not to overstir. Pour into greased or lined muffin tins. In a small bowl, combine the reserved 2 Tbs sugar and 2 Tbs sliced almonds. Sprinkle on top of each muffin. 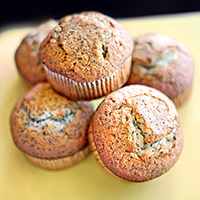 Bake at 375°F for 12 to 14 minutes for a mini-sized muffin tin and 15 to 18 minutes for a regular-sized muffin tin, until fully cooked. Use the toothpick test if needed.